Ross's Law Marketing Blog: I LOVE this campaign. "LARGE, yet agile." I LOVE this campaign. "LARGE, yet agile." 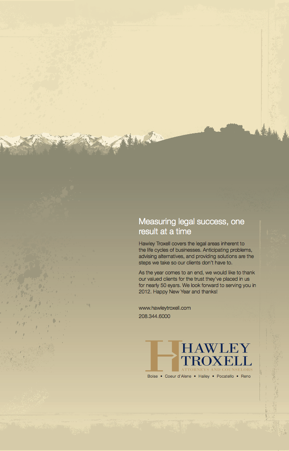 We’ve been working with Idaho’s largest law firm, Boise-based Hawley Troxell. They’re an impressive and creative group of lawyers, the biggest firm in town, but still fast and flexible. When you’re the biggest firm in town, use that to your advantage, it’s a powerful differentiator in a bigger-means-better culture. It’s an attribute your competitors can’t claim, and we wanted to ensure we'd locked in that position as regional firms began moving into town. Predictably, their smaller competitors’ messaging has sought to position their firms as faster and more nimble. 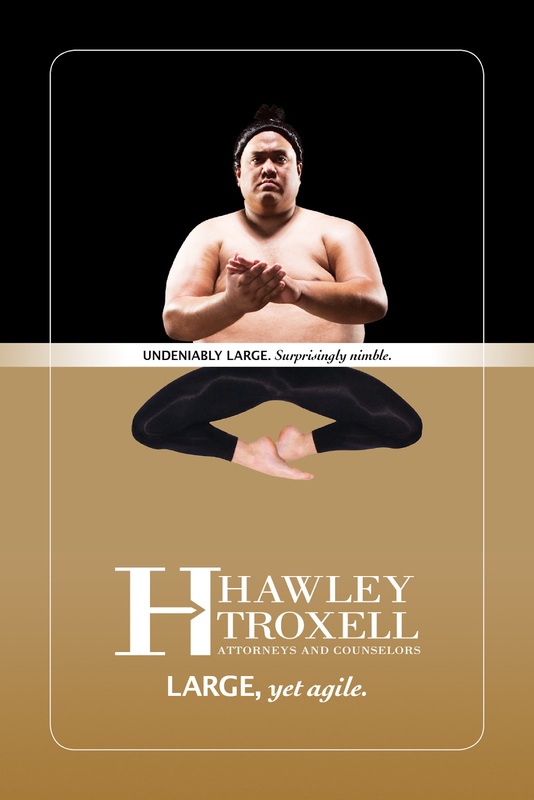 Obviously, if you’re not the biggest firm, an equally legitimate counter-strategy is to use their size against them, typically claiming that they’re slow and inflexible, i.e. a hard-to-turn battleship. It’s a message we were increasingly hearing our competitors were using against them. 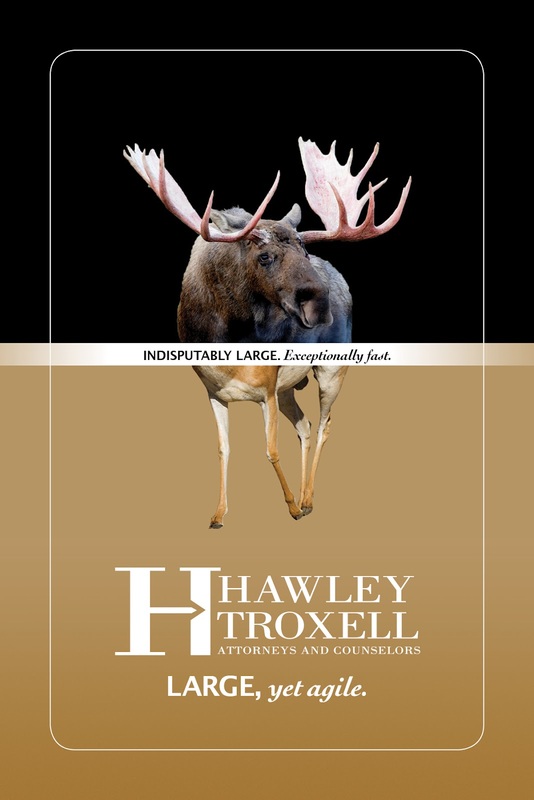 The firm’s strong reputation as a collegial firm with outstanding technical skills had worked in our favor, but the market who knew us was aging, and we needed to renew and revitalize the brand for the Boise transplants and the younger members of the community. The firm's historic marketing efforts were safe and traditional - the type of tools every markets' biggest and oldest firms typically use, e.g. lots of sponsorships and charitable contributions. Nothing wrong with that except the proportion is usually too high -- the largest firms in most markets, even small markets, tend to spend too much on these types of activities out of a sense of community obligation. And once you say yes, it's hard to say no next year, so the quantity continues to increase, regardless of the relative value or ROI of those contributions. We wanted to ensure that our prospects knew we were Boise’s biggest firm, with the best lawyers, top specialties, and most resources. 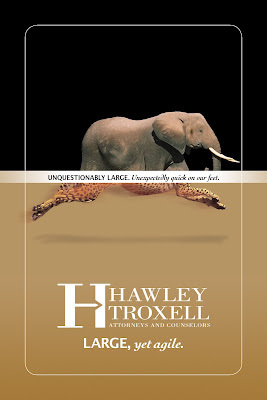 But we also wanted to show that we were a dynamic, nimble, fast-moving firm -- the best of both worlds. This split campaign is visually powerful, conveys the entire story in the graphic and a short headline. It's an effective visual for that reason. Change is hard for lawyers, but the firm had already begun a fairly sizable shift. They'd hired a dynamic Executive Director, Susan Olson, who was always looking for cost-effective and creative new ideas, and they had a skilled new marketing team - Marketing Manager Stacey Taylor and Marketing Partner Tom Mortell. They might not have known what they needed or what it looked like, but they were ready to take a step forward, and they were savvy enough to recognize it when they saw it. So here’s how we expressed that message. The pictures tell the story, and the headlines (e.g. "UNQUESTIONABLY LARGE. Unexpectedly quick on our feet.") reinforce it. The font style matches the “LARGE, yet agile” tagline. Apparently there are a lot of moose and antelope in Idaho. Now we just need to update the website to incorporate the design better. Here's an example of the "Before" campaign. These new materials are a pretty big step forward for them. BTW, if you're ever going to visit beautiful Boise, note that it's pronounced "BOY-see" not "BOY-zee." Looking for a new website or campaign? Call us! +1.847.432.3546 or ross@fishmanmarketing.com. All images (c) 2012 Hawley Troxell. I wasn't expecting that from a law firm. Who knew you guys could get as creative with your marketing pitches as some people I know who do web design in worthing.